UPDATE: Not only those sites! Also if i run FULL SCAN, thousands of files are detected as virus! Can u imagine what happen if some user delete those files and no more boot up PC? This is unacceptable! Thank you avast. This is not first time i see that huge mistake in your products. UPDATE 2: Thanks for fix, everything is ok now. Re: False positives? Or what is it? I'm getting all sorts of hits on my computer and VM today with Avast warning me about a generic "VBS:Malware-gen" when I open Google Chrome. I ran a "Full system scan" and I'm at 1,000+ hits and counting, and my drives are only about 24% scan completed). The irony is Avast's "Smart scan" detects nothing, but the "Full system scan" does. What good is it if it can't detect jack? I ran online scans from ESET, Trend Micro, Kaspersky, and F-Secure and they all came back negative. I use Macrium Reflect to back up my system so I restored a full image from about 2 weeks ago (errors only started today), and Avast is complaining about files being infected from this restore too. I powered up my laptop (which I haven't used for months) and updated Avast's antivirus definitions and ran a Full system scan on there. It's also detecting the SAME THING. I'm going to restore my system to about 2 years ago to see if Avast still detects it too. 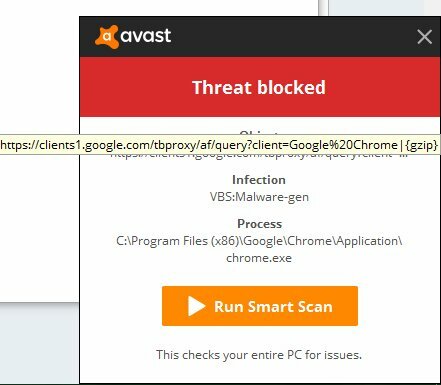 The last time Avast reported false positives was a few years ago. n00bishly, I let Avast delete my Windows system files and had to do a complete reinstall of Windows. Is anyone else running into this same problem? OMG, if i run full scan, thousands of infected items. This is real? I got random virus alerts from twitch.tv or other random well know website like neogaf forum. Try do full scan, you wil lbe surprised how avast detect all your files in computer as virus. I get an alert about google chrome about every 5 or so minutes, and i got one from twitch earlier. I'm running a full scan now and it says theres infected files but I don't think they are? I'll upload a screenshot when i get another chrome one. This is what i get every five minutes. anyone else got this too? this was NOT happening earlier today. I'm getting the same VBS alert as well. It just started around 2 hours ago when I got on my computer. No biggy, everyone using avast right now may have random report, using their browser. May be fix later today, i guess. I'm also getting this exact problem on random websites I go to, roughly every five minutes. I scanned my computer with avast, roguekiller, malwarebytes and several others and none found anything either. if i run FULL SCAN, thousands of files are detected as virus! I'm on a Mac and today I am getting a similar result - 500+ "VBS:Malware-gen" identifications and the deep scan is only 50% done. Sounds like this is some kind of erroneous detection going on today. Hopefully this will be fixed soon. Ran into it via Opera. I hope this gets fixed soon.